Kenyan marathoner, Rita Jeptoo, a three-time winner of the Boston Marathon and two-time Chicago Marathon champion, was given a two-year doping ban Friday. 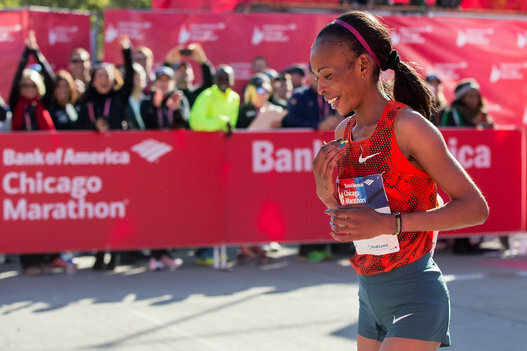 Jeptoo tested positive for the blood-booster EPO in an out-of-competition test last September, a few weeks before winning her second straight Chicago Marathon title. Both the “A” and “B” samples were positive. Athletics Kenya announced Friday that Jeptoo was suspended from all competition until Oct. 29, 2016. Jeptoo has the right to appeal her sanction to the Court of Arbitration for Sport. Her two-year penalty is the maximum for a first violation specified by the old World Anti-Doping Agency code, which was in effect when she tested positive. That penalty was doubled in the new code that went into effect Jan. 1. The World Marathon Majors is a the six-race series that includes Boston, London, Berlin, Tokyo, Chicago and New York. It has the authority to demand repayment of prize money under the terms of its athletes’ contract. However, any such action and the stripping of her titles will remain on hold until the appeals process is exhausted. Jeptoo’s $500,000 WMM bonus for winning both races last year is also in limbo until the case has run its course. Prior to Jeptoo’s positive test, no other prominent Kenyan athletes had been busted for doping. But now the positive test has cast a shadow on all Kenyan runners calling into question their performances. “Her positive test has made it very difficult for us,” two-time women’s marathon world champion Edna Kiplagat said. “We keep on being asked about doping every time we go to compete out there, and I’m hoping that her punishment will make others stop engaging in this bad thing. To many people, the two year ban on Jeptoo is not enough. Shalane Flanagan, the top American woman finisher in Boston last year, told ESPN that she doesn’t feel the two-year ban is enough. “My stance on anyone caught cheating or doping is that they should receive a lifetime ban,” Flanagan told ESPN. “Studies have shown that someone who’s tested positive for something like EPO, which Rita apparently has used, have benefits that go beyond just the usage. If she used EPO for a number of years, she was able to train at a much higher level during those years. From a Kenyan perspective, Rita Jeptoo deserves a bigger ban for the sheer damage that she has done to the reputation of other Kenyan runners. Now every time a Kenyan wins a major city marathon, people will question whether they are clean. It is incumbent on Athletics Kenya to start taking the doping menace seriously. It appears AK has finally woken up from their slumber. Anti-doping bodies from Norway and China are helping Kenya set up its own anti-doping agency. This entry was posted in Kenya Athletics News, Kenya Sports news and commentary and tagged edna kiplagat, Kenyan marathoners, Rita Jeptoo. Bookmark the permalink.